New York-based Schatz Bearing Corporation designed and manufactured a unique swageable ball bearing, the first of its kind. (Newswire.net — December 19, 2017) Poughkeepsie, New York — Decades of industry innovation is the hallmark of the Schatz Bearing Corporation, a leading manufacturer of precision ball bearings and motion control products for industrial applications. The company, based in Poughkeepsie, New York, recently announced that its engineers have developed a unique swageable ball bearing, which can be considered the first of its kind to enter the precision ball bearing marketplace. The company tested and validated the bearing design, which offers significant advantages for manufacturers and end-user maintenance teams. “The swageable bearing design saves weight while providing protection against damage during installation,” says Stephen Pomeroy, Ph.D., President of the New York bearing manufacturing firm. “It also offers a more robust installation method as compared to traditional press fitting of bearings.” To learn more about this innovative new precision bearing product, visit https://schatzbearing.com/ball-bearing-products/airframe-aerospace-bearings/swageable-ball-bearings/. The new swageable ball bearing was designed for use in the aerospace industry, particularly in airframe control applications. Each bearing of this innovative design meets or exceeds BAC5435 standards for installation and retention of anti-friction ball bearings, a standard developed by the Boeing Corporation. The new bearings also meet the U.S. Government’s Military Standard 1599 (MIL-STD 1599) for bearings and control systems components. Its advantages are many, especially in installation and maintenance. The single-row, or double-row bearing design eliminates the need for the external sleeve components to be swaged during installation, reducing end-user assembly costs. The outer-rings were developed to eliminate common sources of damage during installation and maintenance as well, helping to drive down maintenance costs. Finally, the design of the bearings offers a more robust installation method as compared to press fitting or anvil swaging of bearings in installation processes. The bearings feature inner and outer rings that can be plated to resist corrosion, with the option to specify stainless steel. The bearings are equipped with advanced seals to prevent intrusion of contaminants, and come pre-lubricated. Schatz Bearing Corporation boasts some of the precision bearing industry’s most advanced design and manufacturing expertise. While the new swageable bearings come in several stock configurations, the company can also custom-design bearings with features needed by specific industry applications. Bearing precision levels, starting torque, and materials specifications can be adjusted or modified to suit the needs of end users. “Our engineering team and manufacturing capabilities allow us to respond quickly to customer needs,” adds Dr. Pomeroy. 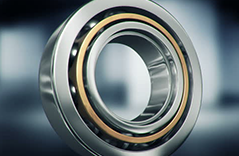 “The new swageable bearings advance the science of precision motion control while lowering assembly and maintenance costs.” For more information on the company and their extensive line of precision bearing components, visit https://schatzbearing.com/. New York based Schatz Bearing Corporation is a world-recognized manufacturing leader of the highest-quality precision bearings and linear motion products. Its products can be found in many applications, including the aerospace, defense, and automotive industries. The company is known for its innovation and adherence to industry-leading quality in bearing manufacturing. All of the products produced in their Poughkeepsie facility meet or exceed AS9100 Rev. C and ISO9001:2008 standards. The vast experience of the company has allowed them to design and produce specialized solutions for specific industry applications.